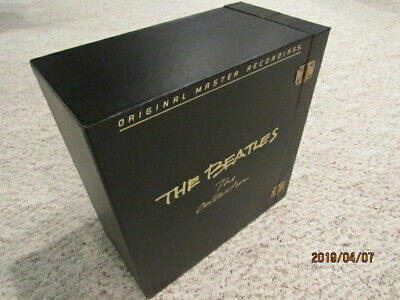 THE BEATLES - MOBILE FIDELTY SOUND LABS MFLS VINYL RECORD BOX SET - LIMITED EDITION #20,680. INCLUDES MINT, LIKE NEW HINGED, DOUBLE DOOR OUTER STORAGE BOX, 14 NUMBERED HALF SPEED MASTERED VINYL LP'S, EACH IN OUTER JACKET, INNER FOLDED SLEEVE, PLASTIC PROTECTIVE SLEEVE AND LP. DELUXE COLOR BOOKLET WITH CERTIFICATE OF AUTHENTICITY, #20,680. INCLUDES GEO DISC IN FOLDER SLEEVE WITH INNER CARDBOARD PROTECTOR. INCLUDES ORIGINAL MFSL OUTER SHIPPING CARDBOARD BOX. I BOUGHT THIS SET APPROX. 20 YEARS AGO FROM ORIGINAL OWNER, HAS BEEN IN MY RECORD LIBRARY EVER SINCE, NEVER PLAYED. FROM THE LOOKS OF THE VINYL, I DON'T THINK THE ORIGINAL OWNER EVER PLAYED EITHER. THIS IS ABOUT AS CLOSE TO NEW AS YOU WILL FIND! OUTER BOX HAS NO NICKS, DINGS OR SIGNS OF WEAR! SHIPPING WILL BE $40 AND INCLUDES FULL INSURANCE. USA SALES ONLY! ADDITIONAL PICTURES AVAILABLE UPON REQUEST! DUE TO THE RARITY AND HIGH VALUE OF THIS BOX SET, IT IS SOLD AS IS, AS DESCRIBED, THERE WILL ABSOLUTELY BE NO RETURNS FOR ANY REASON. IF YOU ARE NOT COMFORTABLE WITH THAT, PLEASE DO NOT BID. THIS SET IS FOR SOMEONE WHO TRULY APPRECIATES THE RICH HISTORY AND VALUE OF THIS OFFERING. FOR BUYING CONFIDENCE, PLEASE CHECK MY EBAY RATINGS AND HISTORY OF SELLING SINCE 1999. THIS IS A VERY HEAVY BOX SET AND WILL BE PACKAGED WITH THE UTMOST CARE OF A TRUE COLLECTOR, SO THE NEXT OWNER CAN ENJOY THIS BEAUTIFUL COLLECTION IN ITS VIRTUALLY LIKE NEW COLLECTION! The Beatles: The Collection is a vinyl boxed set of every Beatles album until '82 remastered at half speed from the original stereo master recordings, except for Magical Mystery Tour which was mastered from Capitol Records' submasters with the last three tracks in rechanneled stereo. Released with much anticipation in early October 1982, The Collection was lauded by critics and Beatles fans worldwide for the superb sound, and sold-out completely within the first year. Mobile Fidelity Sound Lab (MFSL) pressed a second run of the Beatles Boxed Set for a total production run of 25,000 over the next two years or until October 1985. Each of the 14 albums was pressed on black vinyl by the Victor Company of Japan. The album covers were replaced with photographs of tape boxes and log sheet. The original album covers were included in a booklet which also featured a certificate of authenticity as this was a limited edition collection. Missing from this collection were all of the Beatles' singles, extended Play and a few miscellaneous tracks that did not appear on their original UK albums. From my record library, heat and humidity controlled. I am not a store, just a collector who is thinning out the herd. I make it to the post office usually twice a week, so please be patient. I will post tracking number as soon as it is shipped to you. I also package everything very carefully by hand, using professional record mailers for added safety. USA SALES ONLY! NO EXCEPTIONS!!! Rick Springfield: Human Touch + Celebrate Youth. 45 / 7". Picture Disc. Introducing THE BEATLES Mega Rare Original Vinyl Lp Jan 1964 VJLP-1062 Beauty! Very Very Rare Boot Leg Of The Beatles "Off White" Album White Vinyl MINT! PHIL SPECTOR: "Anthology 1959-1962": NEW 2 LP SET GATEFOLD COVER: 35 SONGS U.K.